We recommend use of a water repellant spray on all our bags for protection from rain, water and mud. 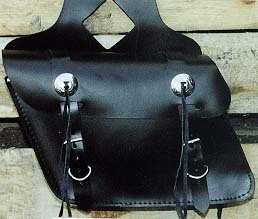 All throw over saddle bags are universal and fit on most bikes, all years. Sizes: 12 1/2 "x 9" x 4"